Institutional Software Administrator: This account is created at the highest level of the institution. The Institutional Software Administrator has the ability to allow access to and allow others to grant access for all of the rights options. Sub-level Unit Software Administrators: These accounts are created at the sub-unit level and can have full administrative rights; however, access is also determined by the access assigned to the unit. Faculty with Administrative Rights: (e.g., deans, chairs, etc.) These accounts may be tiered throughout the organizational structure. These accounts are created at the subunit level and can have reporting or full administrative rights; however, access is also impacted by the access assigned to the unit. Staff with administrative rights: (e.g., departmental administrative support staff). Support accounts for these users can be created at the subunit level, and the users can have reporting rights, full administrative rights, or limited rights; however, access is also impacted by access assigned to the unit. If faculty members and administrators are manually added to FACULTY180, administrative rights can be assigned to them when they are added. For more information, see Add/Edit: Faculty. They only have access to the faculty member's menu - evaluation data for the faculty member is restricted. From the Admin section of the navigation bar, click Administration. Click Administrative Rights in the Add/Edit section. The Faculty Selector screen displays. 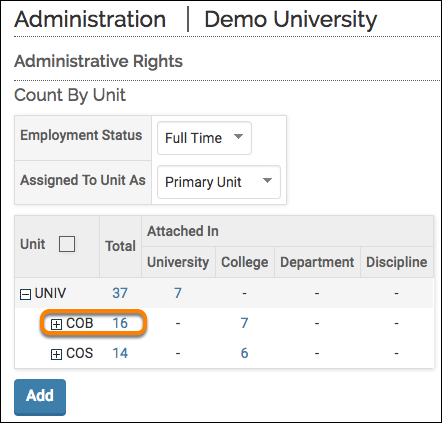 Click the unit that the faculty member's unit where you wish to assign administrative rights is assigned. The Manage Administrative Rights screen for the selected unit displays. Click the Edit icon adjacent to the faculty member that you wish to assign administrative rights. The Faculty Form screen for the selected faculty member displays. The Administrative Rights section shows existing administrative rights that may have already been assigned.